Another version of Yamahomo’s “it takes forever” dish. Apparently French people don’t know about this dessert, but it is one of a kind. I first saw this at Takashimaya in New York. There is a pastry shop called Lady M., and they have an EXPENSIVE layers of layers of crepe cake for like $50 a pop. Being a frugal chef, I was like, “hm, I can definitely recreate this with even better flavors”. So here they are. 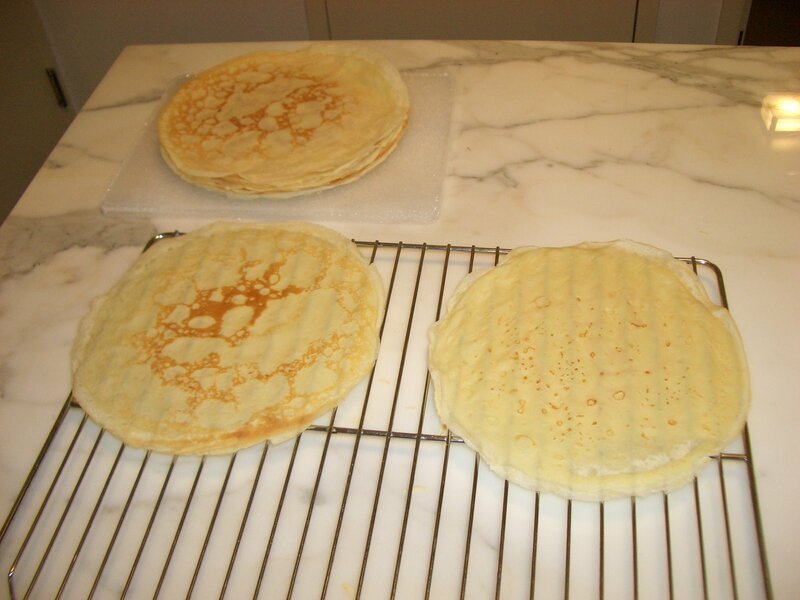 You make bunch of crepes, then fill each layer with whatever cream you like. Quart of milk (use the real thing) and 5 eggs mixed together. Add about 3/4 cup of suger (120 g), then add 2 cups of flour (sifted). 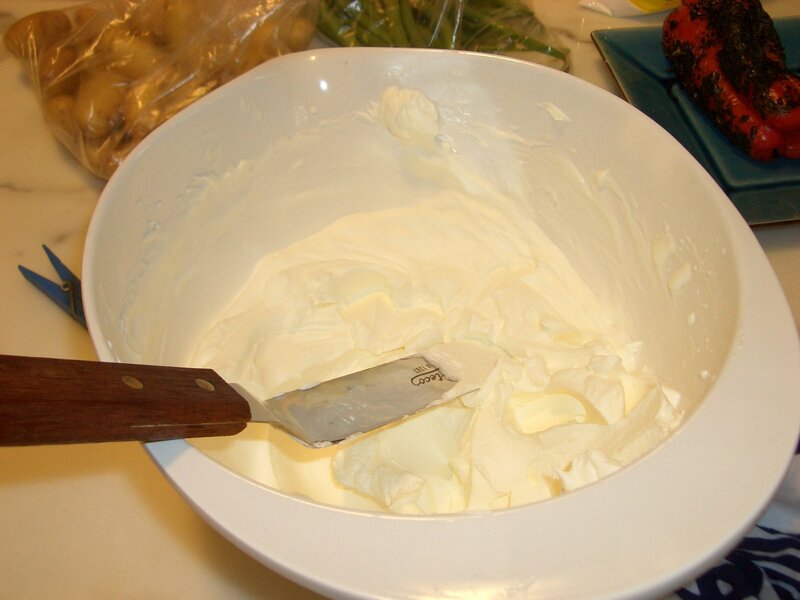 Once everything is mixed together, pour 1 stick of melted butter. Important part is to rest the batter for at least an hour. Put it overnight, it makes even better crepes next day. 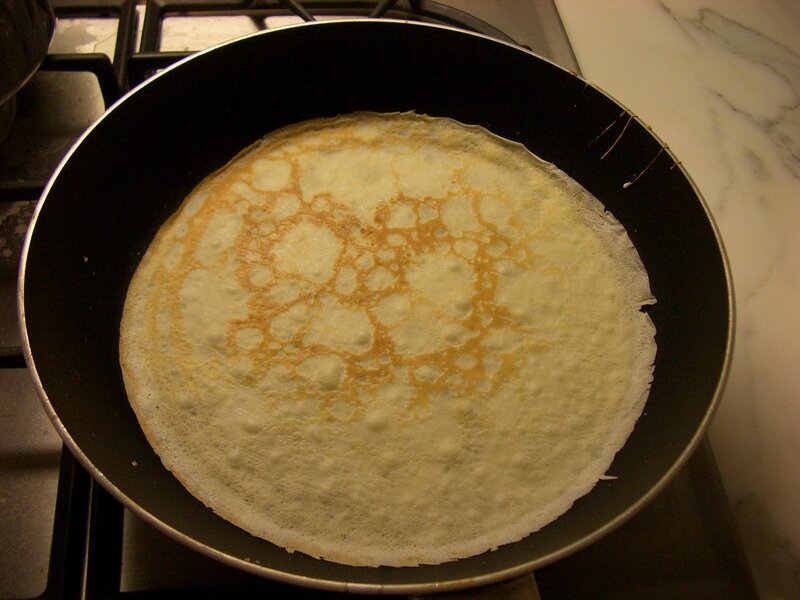 I don’t have a fancy crepe pan, and using regular teflon coated pan works perfectly. Medium to medium low heat will be the best. Once edges are getting brown, you flip it (I use my fingers, and it’s the easiest way, but man it burns ya), cook a bit more on the other side. You repeat this process till the batter is gone. Now it’s time to make cream. You can make custard, whipped cream, whatever. I usually melt a bag of bittersweet chocolate then whip up a pint of heavy cream (no sugar added, chocolate has enough sweetness), then mix them together. But this time, since it’s summer, I whipped up heavy cream with powdered sugar, and once the cream is about to be done, I added watermelon flavored Rum (it’s good) to give a little kick. 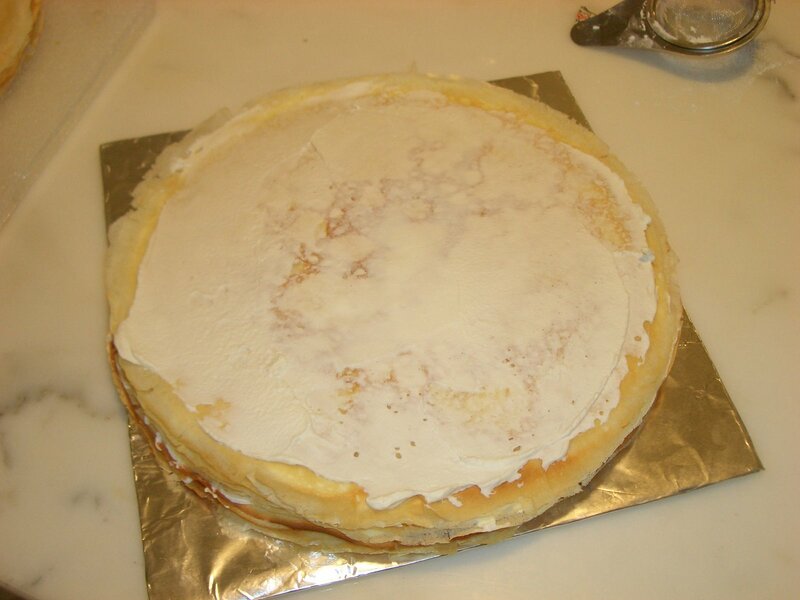 Above recipe will give you about 20-23 layers, but sometimes i double the batter so that i can make a very thick cake. The best thing about this cake is that it is so easy to transport. I made this for my bf’s surprise birthday party at a bar, and you don’t have to worry about outer creams at all. You just wrap them up, and bring to wherever. Since it is such a labor intensive cake, it surely impresses your guests. This entry was posted on July 9, 2007 at 7:27 pm and is filed under *Yamahomo, dessert, recipe. You can follow any responses to this entry through the RSS 2.0 feed. You can leave a response, or trackback from your own site. this was one of the very few perks i got from working at at JS — getting free mille crepes from you! THE BEST. makes my mouth water. thanks for sharing your secret recipe! That is waaaay too labor intensive! I mean, for ME to make. But I want to eat it.